The whole process of enjoying wine should be an absolute pleasure. Opening up with the beautifully designed Starfrit corkscrew. Pinch and a capsule cutter slips through the foil cover. Turn and the none stick coated spiral glides into the cork, your thumb and finger applying the slightest pressure to the large ergonomically designed handle. 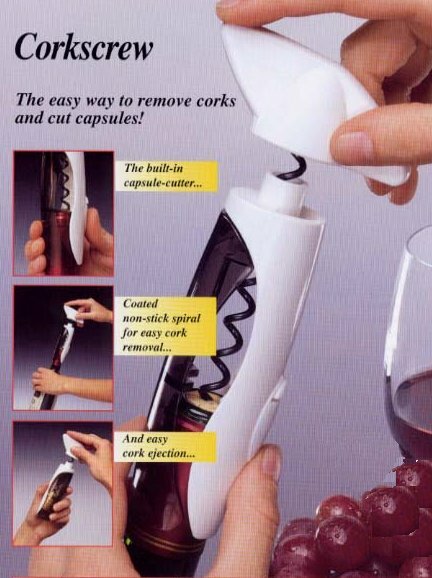 Remove your cork and find it slips easily off the wine bottle opener. Take a sip and congratulate yourself for ordering. Corkscrew text, images and video are copyright.